Built on the heritage of the acclaimed Concero Switchboard, the TalkSwitch series is the next generation of affordable phone systems for small businesses. The TalkSwitch 480vs is a compact, all-in-one telephone system that puts the rich features of PBX systems into the reach of small businesses. Its built-in voicemail, multi-level auto attendants, innovative remote extensions and sophisticated call handling features help businesses look big, reduce communications costs and stay connected everywhere. With standard connections for fast and easy installation and free PC configuration software, TalkSwitch 480vs system set up and changes are a snap. The system is designed for easy growth and is upgradeable to include Voice over IP capabilities. TalkSwitch professionally and efficiently manages calls, seamlessly links off-site staff to the office, and can grow with evolving communications requirements. Your work doesn't stop at the office, and neither does TalkSwitch. With Connect Anywhere extensions, it's like having your phone system anywhere you go. Your customers, employees, teleworkers and partners stay connected, and people reach you and your staff with one main number to dial, no matter where you are. Any phone, anywhere, can be a remote extension; cell phones, home phones, even phones in other offices. Calls can be seamlessly transferred and screened. Just plug a TalkSwitch IP phone in anywhere for complete extension functionality. It works just like local IP extensions. Three-digit dialing, intercom calling and membership in ring groups and call cascades? You bet. You can even get line appearance. Extensions: 8 standard 2-pin RJ-11 ports — TalkSwitch 480vs units support up to 8 standard analog telephones and fax machines or IP telephones. Audio Input: 1/8" mono phone jack allows connection of standard audio devices (CD players, radio or PC soundcards) for music or messages on hold. TalkSwitch can also play a .wav file stored on the TalkSwitch. Ethernet Connection: RJ-45 10BaseT Ethernet connection for LAN networking and management. Memory Card Slot: The TalkSwitch 480vs has 30 minutes of built-in voicemail and auto attendant memory, which can be upgraded by up to 9 hours. 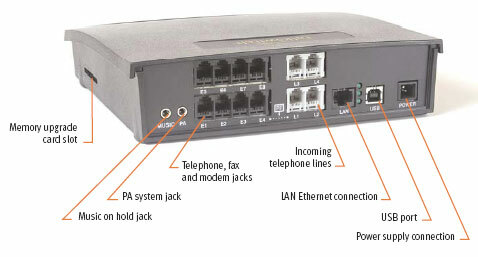 Incoming Lines: 4 standard 2-pin RJ-11 ports; support for Caller ID and distinctive ringing. USB Port: TalkSwitch 480vs units can optionally be connected to a PC via a USB port for configuration. Ethernet cable and configuration software is included. The system does not need to be connected to a PC to function. Single and multi-location organizations come in all shapes and sizes and each its own unique telephone needs. So we designed TalkSwitch with a smooth evolutionary path that protects your investment. TalkSwitch is made to expand with you as company grows and changes. Add lines, extensions, VoIP trunks or all three with TalkSwitch upgrades, or add TalkSwitch units to your network for increased capacity. TalkSwitch systems can expanded up to 16 traditional lines, 16 VoIP trunks and 32 local extensions. Software: TalkSwitch comes with free user-friendly Windows-based configuration software. We’re continually adding features and functionality to our software, don’t charge for updates. 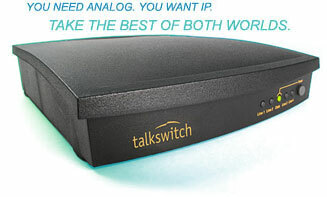 The TalkSwitch 480vs is covered by a limited one-year warranty.